For many travelers, stepping out of a train at the Bucharest Gara de Nord station may be the most exotic and intimidating arrival they’ve experienced in all of Europe. 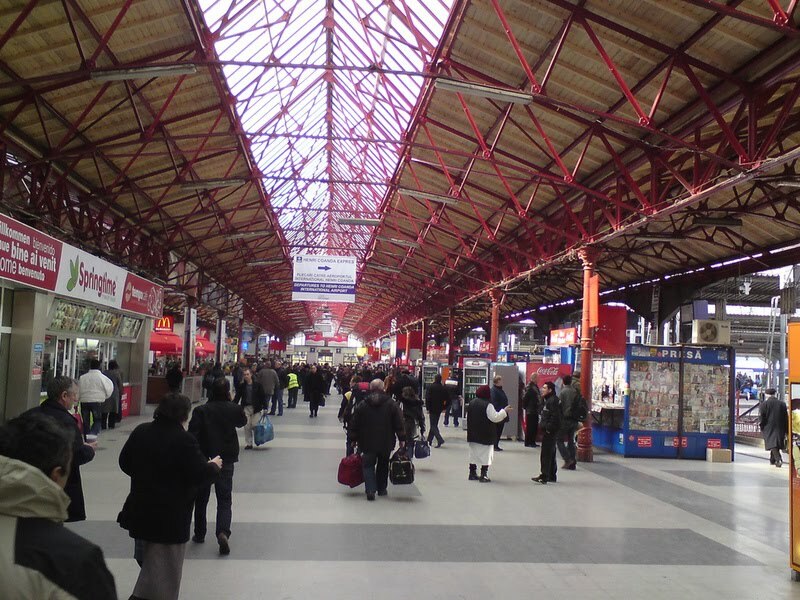 The Bucharest Gara de Nord train station is the largest in Romania and usually the only one that travelers will use. There is definitely a marked difference in atmosphere from neighboring major hubs such as Prague, Vienna, or Budapest. 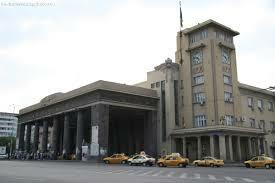 The somewhat somber façade of Bucharest Gara de Nord is a testament to its history. Constructed in 1872, this building was a stop en route to the Eastern Front during the First World War and was later bombed by the Allies in 1944. About 200 trains now pass through the terminal on a daily basis. Typical outbound destinations include other parts of Romania as well as the international cities of Budapest, Vienna, and Sofia. Anyone who plans on departing from the station or changing trains here should consider purchasing their tickets in advance, because the popular routes may sell out quickly. Sadly, Gara de Nord may not deliver the most positive impression for new or repeat travelers. In fact, there are a good many safety issues that you will want to consider if this station is part of your route. We were a bit nervous finally pulling into the outskirts of Bucharest after overnighting from Budapest. Warned by one of our co-passengers to mind our compartment’s belongings during previous stops, we’d also been advised in broken English by both of our jovial new friends, the porter and waiter on staff, to keep our wits about us as we exited the train. Bucharest Gara de Nord can feel like a free-for-all with all sorts of characters roaming about, ranging from Roma (gypsies) to taxi huxters. We were immediately approached by a shady-appearing individual who was quite insistent upon “helping” us get to a currency exchange and “the best” taxi. Despite repeated assurances that we didn’t need his services, it was disconcerting to be openly followed around the station as we went about our business. It is not uncommon for arrivals to be offered private money exchanges, despite the fact that this is illegal. We noticed all sorts of would-be wise guys self-staging at various intervals along the international arrivals platform. An active petty criminal element also can be found here, including pickpockets, so those making their way through Gara de Nord should exercise the usual cautions. Some travelers also report being told their hostel is either temporarily closed or no longer in service. It is best to ignore these various offers of assistance and information. Making matters worse is the fact that security at Gara de Nord is varied in its intensity and one never knows what to expect in the way of police presence. However, the train station does have its good points. It is open 24 hours a day, so there are no worries about being locked out, although I would question the wisdom of waiting for any length of time during the night. The ATMs at this location are conveniently located. We observed a Roma woman leaving her child unattended during a transaction, and when the baby wandered, two kindly babushkas were there to save the day. There are two currency exchange offices. Be aware that the one closest to the international arrivals area is the smaller of the two. When we arrived during the late morning, the smaller office was already low on Romanian cash, so unexpectedly closed. Bucharest Gara de Nord also has complimentary Wi-Fi throughout (although it is insecure, so you’ll want a VPN or other security precautions if you need to log in; we waited until we got to our hotel). Signs will seem easy to understand by comparison with Hungarian or Czech, as the Romanian language has Latin/Romantic roots. Hungry travelers can choose from onsite fast food eateries such as KFC, Subway, and McDonalds, but there are other vendors and a small supermarket here as well. Those who are leaving from Bucharest Gara de Nord for the city or the airport should take care to avoid the many illegal taxis that often charge double the price of the correct fares for various routes. Therefore, it is best to only use the services of those cabs found in the officially designated taxi stand area. As with anywhere else, make sure the taxi drivers use the meter and have the correct tariff written on the doors. Avoid drivers who offer you an alleged bargain. Travelers departing the station can also take the metro or the bus, both of which are cheaper alternatives to catching a cab. If you’re on foot or changing trains, be aware that there is a sizable number of homeless young people in the vicinity who frequent the Bucharest Gara de Nord waiting rooms in cold weather. 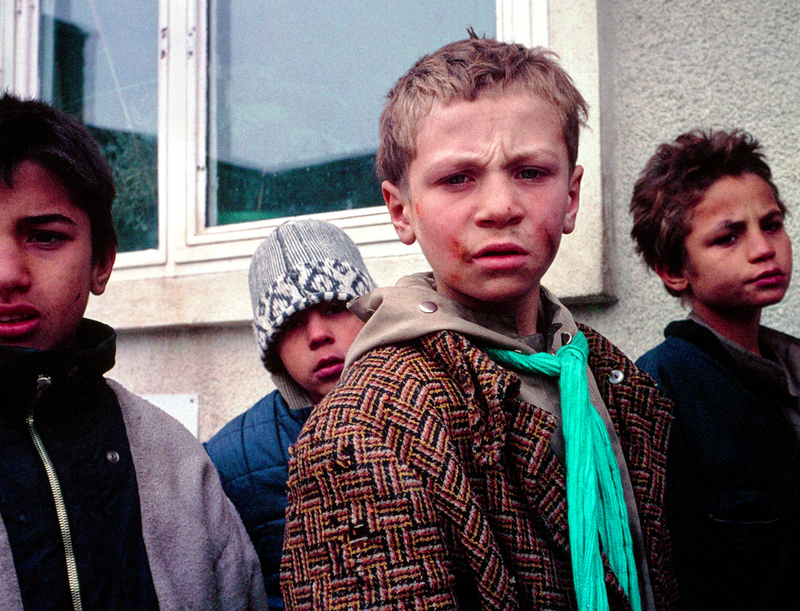 These are the “sewer children,” drug users who frequent an underground network of tunnels. One of the main entrances to this underground city is, improbably, a hole in a traffic island just outside the station. While many of these kids are HIV positive, the greater concern is that about 25% of them are tubercular, as well. Unfortunately, not much has changed for this segment of the population since Ceaucescu was removed. The 780 Express bus line (schedules) connects directly to Henri Coanda International Airport with stops in front of both the Arrivals and Departures Terminals. Tips and Observations: Bucharest isn’t all doom and gloom, but it definitely is a mixed bag if you’re used to Western or other Central European hubs. Our taxi driver repeatedly crossed himself every time we passed an orthodox church on the 15 minute ride to our hotel. When we asked whether he was religious, he answered, “No, it was just in case.” We stayed at the Radisson Blu Bucharest, a modern business hotel located close to the city center in a mixed neighborhood – shabby yet still dignified Belle Epoch grand residences interspersed among Soviet-style small apartment blocks – undergoing extensive renovation. We had a lovely meal at La Mama, within walking distance, which was just authentic enough to satisfy our tired, hungry palates. There was quite a bit of February snow hampering pedestrians and vehicle traffic alike. On our way back to the hotel, we observed an empty purse in a snowbank and were unexpectedly castigated by a private citizen with a snow shovel; we hadn’t tipped him for clearing our path. Commercial snow removal appeared to be non-existent. Still, we found Bucharest had its own charm. Service at our hotel and restaurant was warm and hospitable. The city atmosphere was equal parts optimistic and determined. We’d love to return and spend more time in Romania. European Luxury Hotels: A Month of Affordable Stays! Excellent article for anyone visiting Romania, I appreciate your candid pro/con approach. Great advice! Bula Marilyn – Thank you, I was hoping to balance the negatives. A city isn’t all its train station, to be sure. Oh, that photo of the homeless little boys is really heartbreaking. What a tragedy. I too found the whole train experience in Romania disturbing. The night train was quite frightening and the aggressive dogs — many missing limbs from being caught under the trains — scary.You have some very good advice. Bula Michele – Yes, the other photos from Larry’s site are heartbreaking as well. The night train experience is one we’ll always remember but probably not repeat. I do look forward to visiting Romania again. The Carpathians were so beautiful and we would like to see Brasov, Sibiu and Sighisoara, to name a few. 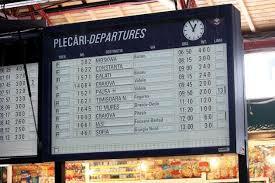 Great info for anyone taking a train in or out of Bucharest. It’s amazing how many trains go through there a day. We get two in Santa Fe (Lamy). It all sound too familiar from other places I have visited. Maybe this is because Bucharest is already closer to the Orient than to Central Europe. Plus it’s certainly one of the poorest countries in the EU. Bula Juergen – This could very well be. The oppression of the Ceaucescu regime is still very evident. But there are bright spots and people are working hard, so there are many positives. You don’t read much about Romania so interesting to get your take on the train station and the city. I’m curious to know whether it’s quite a bit safer once you get into rural areas?? Bula Leigh – I believe Romania is up and coming. There are a lot of positive aspects, particularly for bloggers and digital nomads. The internet speeds are among the fastest in Europe and the cost of living is low. I’m reading more and more from folks who are giving Romania another look and a try, and I do think it is safe enough. The scariest situation I ever personally experienced was years ago on a stationary train in Strasbourg, France. On reflection, I made some poor choices due to fatigue and naivete, so there you have it. I do love European train stations. Though this post doesn’t hit the architectural high points I enjoy most, it sure is helpful with the reality of arrival. Good information, thanks. The train station sounds about like a lot of big city bus stations. Still, we would love to see Bucharest and Romania. Bula Veronica – Yes, exactly. It shouldn’t put you off Bucharest which is a distinctive and fascinating city. The main downtown area is considered one of the safest, and there are many other safe areas around the larger squares and busier boulevards. I did understand that the Farentari and Rahova districts should probably be avoided due to gang activity, but what’s so different about that from many other cities? We’re looking forward to returning. Thanks for sharing a balanced report on the station. In general, it is always a bit nerve-wracking to travel with baggage on European trains. We always feel like we have to keep them under eye. Oh boy – What a helpful and candid description. At this point, there are so many places in the world I want to see, I believe I can skip Bucharest for now. I am glad you traveled safely! Bula Suzanne – I wouldn’t let it put you off. Romania is really amazing. I wouldn’t want to miss NYC or the rest of the United States just because I had a negative experience at Grand Central or Penn Station, so I tend to think of this in the same way. Another terrific post Betsy! I truly appreciate your candid comments and your optimism. It’s always best to keep your guard up when traveling abroad. I’m a huge fan of traveling light with one rolling carry-on and my backpack. It’s easy to manage in most circumstances and you don’t need to worry so much. Bula Sue – Yes, you’re right. When we’re struggling to keep track or carry all the things we were convinced we absolutely needed before we left, we get a reality check. I know I’m overpacked on this trip; the only thing that is saving me is we’re not moving around that frequently. The faster you’re traveling, the lighter you need to go. I stayed near this train station while in Bucharest and agree it’s not the most pleasant of places and I’d never stay there again. But most of Bucharest is perfectly safe as is the rest of the country. I spent a few weeks travelling around Romania. It’s a fantastic country, so beautiful, and I highly recommend visiting, especially in Transylvania. The locals are lovely and the nature and castles are gorgeous. 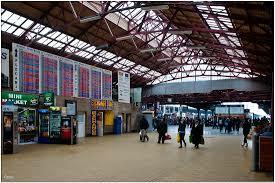 I would hate for people to be turned off visiting by the thought of a dodgy train station. Bula Andrea – I couldn’t agree more. We’ll definitely return to Romania. Wow, that was an eye opening read Betsy. I appreciate your candor and balanced account. Although it sounded like a place I might avoid when I first started reading, your comments and replies make it obvious there is still a lot of positives to visiting Romania. Good food for thought! Bula Alison – You’re right. A single train station (or airport) does not a city or country make. But a bit of awareness never hurts to avoid a situation that might greatly taint one’s experience if unprepared. It kind of sounds like a foreign Grand Central Station. I imagine many international tourists would say some of the same things here. The picture of the homeless boys is heartbreaking, especially when they’re known as “sewer children.” I appreciate hearing the good and the bad, and found all of this information fascinating. I’ve heard the tourism sector in Romania is very welcoming to bloggers and that much of the country is beautiful. However, I think I’ll fly in if I go there – this train station would make me too uncomfortable and I don’t like to enter a country feeling nervous and hassled! I’m going to Budapest next week but from there to Prague but maybe when I’m back in the region next year I’ll check out Romania. I like the Radisson Blu’s – they’re reliable in my experience. Bula Kay – Yes, you’re quite correct. We did have an unsatisfactory experience with the room at the Radisson Blu in Budapest, however. I couldn’t complain because we stayed on points, but it truly hadn’t been renovated since the mauve days of the 80’s, and had the cigarette burns to boot. The Radisson in Bucharest, on the other hand, was exceptionally nice, and not just because we were exhausted. Now that I know what to expect out of this train station, I’d probably travel through it again, but I’d plan to keep my time in it as limited as possible. Love the photo of the homeless kids, it speaks volumes! Bula Nat – Yes, it’s heartbreaking. Yes – the look on the faces of those homeless boys is harrowing. Bula Linda – Thanks for the heads up on the broken link; fixed now. Yes, horrifying and overwhelming. I’ve never been to Romania, so your take on arriving at one of the biggest stations and far from showing just the glamourous side of travel you show what it’s really like – I liked htat. But the photo of the sewer-boys and the implications of that were heartbreaking and something I wouldn’t have known about. I definitely get the picture from this post, and would heed your warning about being alert and prepared. (It reminds me of Ecuador, actually.) Somehow I think readers’ expectations, though, are from the ‘exotic arrival” note, and the ‘mixed bag’ headline. I thought I’d read what is cool about the place, with critical/reality notes included as a counterpoint. Thanks for posting! Bula Kristin – Thanks for your candid comment. There are definitely a few different interpretations one can make from “exotic,” aren’t there? I was coming from the standpoint that Romania is still one of the less frequently visited countries in Europe, and perhaps my choice of words was a bit lazy. We are always exhilarated to arrive in a new country for the first time. But, our excitement (part of which was also from looking forward to being done with the overnight train, which while interesting wasn’t particularly fun) was subject to a major reality check as far as first impressions go. So for us, Gara de Nord definitely was a mixed bag. I’ve never been to Bucharest so this was interesting post to read – thanks for the useful info. Bula Pam – Thanks, glad you found it helpful.